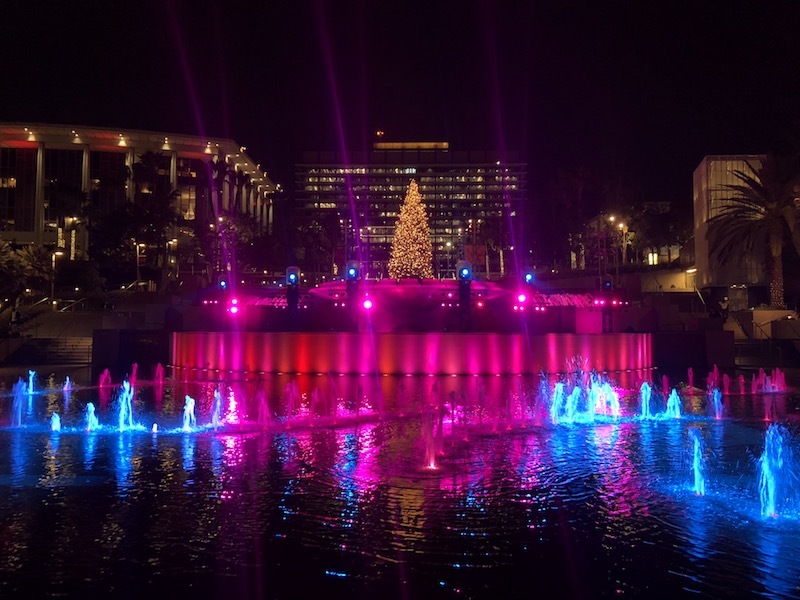 This weekend, from Friday, November 30 to Sunday, December 2, features Canon PORTALS experience, HYPERSPECTIVE free immersive film festival, Grand Park Winter Glow, American Contemporary Ballet presents The Nutcracker, Belmont Shore Christmas Parade, English Cathedral Christmas, Hanukkah at Skirball Cultural Center and MUCH more. 5. LACMA’s latest exhibit, Outliers and American Vanguard Art, highlight a period in American art history when avant-garde artists and outliers (that is, artists without formal training) intersected. 6. Pomona Harvest Festival happening at the Fairplex Expo (Nov. 30 – Dec. 2) will feature vendors showcasing handmade jewelry, blown glass, metalwork, photography, and much more. 7. Since 1969 Bob Baker’s Marionette Theater’s adaptation of the Nutcracker has been warming hearts and delighting kids and adults during the holidays. The show includes over 100 handmade puppets at the Pasadena Playhouse. Running now until Dec. 30. 8. Here and Now transforms it’s newly opened space into a holiday bar called Blitzen’s from November 28 through December 31. Get transported to the the North Pole and enjoy a snow machine, themed entertainment like Bad Santa and carolers, and seasonal food and drinks. 9. LA Auto Show returns with thousand cars on display. From Nov. 30 to Dec. 9 experience various car exhibits, model debuts and more at the LA Convention Center. 10. The annual LA Kings Holiday Ice happening at L.A. LIVE’s Microsoft Square is a daily outdoors holiday skating rink. Open November 10, 2018 through January 6, 2019. 11. The Silent Skate Party is back at the Pershing Square Holiday Ice Rink. Headphones are provided to all skaters, who then have the ability to choose one of three stations to skate to. 12. From Friday November 30 through Saturday December 1, Splendid and 7 For All Mankind will host a warehouse sale at the Cooper Building. 7 For All Mankind, Splendid Kids, Splendid Mills (men’s) and Splendid will all be heavily discounted with prices starting at just $10. 14. The Annual Tree Lighting Ceremony in Downtown Alhambra will bring in the holiday season with a concert with the Alhambra Chamber of Commerce and a pop-up holiday shop. 16. Uptown Whittier Holiday Sonata celebrates “Holidays Around the World” with a Santa’s Village plus a horse drawn carriage this Friday and Saturday. 17. Silent Night, Silent Disco at FIGat7th will feature three DJs curated by KCRW’s Anthony Valadez. The event is open to all ages and is free to attend with donations of food and or new toys required for entrance. 18. Enjoy a special performance of The Nutcracker (Dec. 1 – 24.) by the American Contemporary Ballet high above the city. After the show, guests are invited by The Fairy for a celebration with live music, champagne, and more. 19. Get your holiday shopping done early during Unique L.A. Holiday Market (Dec. 1-2). The event will feature over 300 independent creators showcasing their goods for sale. Each attendant will receive a tote bag, free drinks, access to the photo booth, DJ tunes, gift wrapping and much more. 20. Travel back in time to 1918 during the Heritage Square Lamplight Holiday Celebration (Dec. 1-2). The event, which tells a narrative story throughout its runtime, features a walk through of Heritage Square Museum and various Victorian Homes. Attendees will also be invited to enjoy a cheese and wine reception along with deserts and caroling. 22. Not everything in the holiday is jolly, and that will be evident in Season’s Screamings – a pop-up shopping experience that celebrates the dark side of December. The event will feature a plethora of vendors and exhibitors, a candy bar art show, photo op with Krampus, and an appearance from Cassandra Peterson. Admission is free. 23. Grand Central Market in DTLA turns into a holiday marketplace on December 1-2. featuring local artisans and purveyors. In addition to shopping, ticketed workshops, live music and holiday inspired offerings from food hall vendors. Admission is free. 24. Afters Ice Cream will launch a collaboration with animated series Rick and Morty this Saturday at all 25 SoCal locations. Two new ice cream flavors and exclusive clothing and merchandise will be released. The stores will also be decked out in Rick and Morty decor. All locations will offer its first 50 customers a free Afters Ice Cream and Rick and Morty collaboration t-shirt with any ice cream purchase starting at 6 p.m. on December 1. 26. The Devan Shah Tea Festival comes to Pasadena Rose Bowl December 1 and 2 for one of the nation’s largest tea festivals uniting tea enthusiasts and experts for two days of tea talk and tasting. 30. Holidayfest on South Lake Avenue happening at The Shops on Lake Avenue will offer in-store specials and promotions from over 50 merchants, horse & carriage rides, live music, photos with Santa, holiday characters, carolers, holiday crafts for kids, a themed scavenger hunt, giveaways and more. 32. The Union Station Holiday Festival will host a pop-up artisan marketplace with live entertainment, activities for kids, food trucks, a craft beer garden and cocktails by Traxx Bar. Live entertainment includes SoCal Top Shelf Brass Band, The Beverly Belles and a special performance from The Bob Baker Marionette Theater. Admission is free. 35. Artist Ken Salter brings his experiential installation Garden of Strange Loops: So Tonight that I Might See to Gallery 30 South in Pasadena this Saturday. The exclusive exhibit will allow guests to interact with a “Reflecting Pool” while sensors track the guests movements and transform them into one-of-a-kind psychedelic images in an instant. The exhibit runs until January 27, 2019. 36. Head down to The Fairplex at Pomona for the Chinese Lantern Festival where the theme is “The Wild,” featuring animals represented in lanterns from five different areas of the world, Antartica, Asia, Oceania, Africa and America. Some of the larger pieces stand all the way up to 23 feet tall. The festival run every Thursday through Sunday from Nov. 15 – Jan. 16. 40. The Bai Holiday Ice Rink returns to Pershing Square from Nov. 15, 2018 to Jan. 21, 2019 daily featuring a 7200 square foot outdoor ice-skating experience. A wide variety of events will take place throughout the duration of the rink. 41. Step into a retro-inspired winter wonderland during Miracle at The Everly: Ever Bar happening at The Kimpton Everly Hotel. The Christmas-themed bar open now through December 31 features a candy cane “selfie station,” a 15-foot inflatable Santa Claus, and a dedicated Hanukkah Hut. 42. Beautycon is offering a pop up expereince titled Beautycon POP from Nov. 16 through Dec. 16 daily featuring immersive galleries, makeup brands, vendors, a salon and other beauty related activities. 43. The Foodie Space (Nov. 21- Dec. 30) is the latest interactive pop-up museum designed for serial foodie photo-taker’s. Located in Pasadena the museum claims to poke fun at society’s obsession with social media and #foodporn. Food-themed exhibits include a giant bowl of phở, glitter fries that you can marry and more. Happening Tuesdays through Sundays. 44. Rooftop Cinema Club returns with holiday themed screenings at their Los Angeles venues at LEVEL in Downtown LA and Hollywood location, NeueHouse. The spaces will turn into a Winter Wonderland with holiday decorations, snow and festive food. This weekend they will screen Home Alone. 46. Head to The Walt Disney Concert Hall for an English Cathedral Christmas. The holiday show will have the L.A. Master Chorale performing both classic and modern tunes. 48. Japan House presents Japanese Food Lab a home cooking series that helps Angelenos discover various Japanese ingredients and cooking techniques. This Sunday instructor Tomoko Imade will lead a class in making chakin sushi, a staple at festivals and celebration, this type of sushi is wrapped in a paper thin omelet. In addition to sushi making, students will also see a demonstration on how to utilize seasonal ingredients to make miso soup. 49. Head over to the Regent in DTLA for The Rock and Roll Flea Market. Happening on the first Sunday of every month, this flea market features 50 vendors offering vintage and handmade crafts, including clothing, jewelry, memorabilia, instruments and more. The space will also offer two full bars, a brunch menu, DJ’s all day, and “boozy bingo,” with prizes like tickets to concerts at The Regent. Admission to the flea market is free. 51. On Sunday the East Los Angeles Christmas Parade will celebrate the holiday season on Whittier Blvd with a wide array of floats, bands, folkorico groups, and others marching down the streets. Guests will also be able to enjoy a festival featuring food, games, live music, and more. Admission to the parade is free. 52. The Original Farmers Market Annual Hanukkah Celebration takes place this Sunday from 2:30 p.m. to 5 p.m. featuring live music by Charlie Kramer, story time with PJ Library, entertainment, arts and crafts, the building of a giant LEGO menorah and a lighting ceremony. 53. Get into the winter spirit when ICE at Santa Monica returns with a 8,000 square foot ice skating rink. Running November 3, 2018 through January 21, 2019. 54. The Holiday Light Festival Train Ride at Griffith Park is a festive one mile ride on the tracks with tens of thousands of lights to get you in the Holiday spirit. Running daily Nov 23 through Dec. 23 and then again from December 26 to December 30. 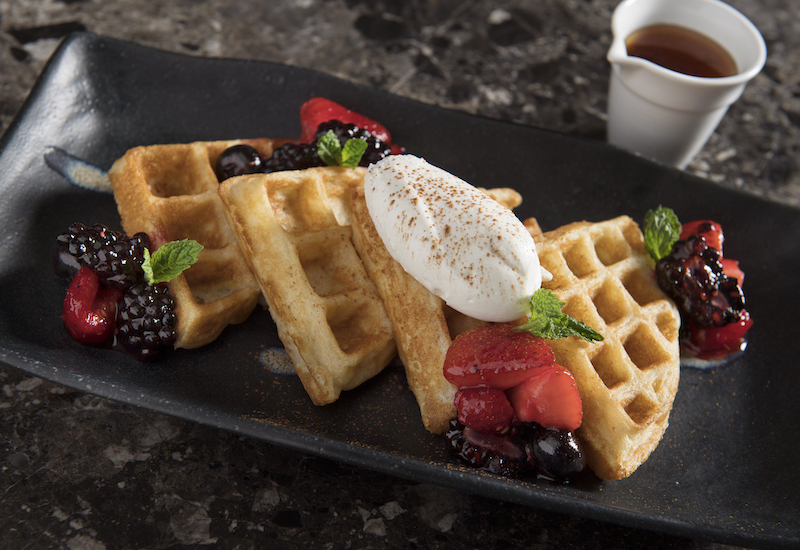 WP24 by Wolfgang Puck has launched a holiday “Kitchen Brunch” series inviting the public into their kitchen for an interactive Sunday brunch. The culinary team will open their kitchen up to diners and share techniques of preparing brunch for the day. Then guests will be invited to enjoy multiple food stations in the dining room. On the menu: dim sum, wok fried vegetables, hand-rolled sushi, eggs benedict, Belgian waffles, mixed salads and freshly-baked seasonal pastries. Festive cocktails will also be available during Sunday brunch.